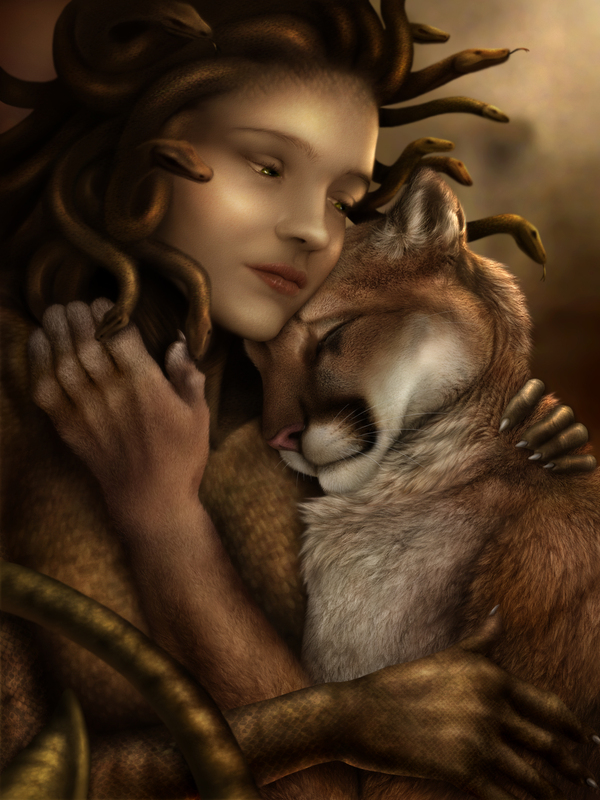 I've always been into mythology (of many different cultures) and one of the stories that's always gotten to me was that of Medusa. Depending on what version of her tale you subscribe to, Medusa started out as a beautiful woman who had tons of guys chasing after her but one night, Poseidon (a god) caught sight of her and pursued her. Medusa spurned his advances and fled to the temple of her godess, Athena, hoping that her godess would protect her. With Athena being a no show, Poseidon raped Medusa on Athena's alter. This of course enraged Athena and instead of taking it out on Poseidon (some thing she couldn't do as he's one of the higher up level gods), she cursed Medusa, turning her hair to snaked and making it so any man who looked upon her would turn to stone. Some stories went so far as to depict her as having a snake tail for a body to further the monster image. So Medusa fled to a place where she could be alone, ravaged by man and forsaken by woman (her godess). Its little wonder why she'd be aggressive towards every one, though it'd have been more interesting had she taken the Perseus route and fought back against the god. But with such a sad tale, I offer you this one and the picture to go with it. A lonely demon, barely in the form of man, chanced upon the gorgon Medusa and with him appearing as such a beast, he did not incite her anger. So there they were, held tightly within one another's embrace. That was the general idea behind it, I almost had Jocarra put a tear in Ropes' eye but figured it'd make it too sad.